I've been writing full-time for ComicsAlliance for almost a year now, but it was only a few weeks ago that I realized what may be the most important thing I've discovered since I quit my day job: Since I work from home, I can watch two hours of Walker, Texas Ranger every single day. And that has been a life-changing realization. Okay, look: I know the whole Chuck Norris thing is played out, but seriously? This show is amazing. In the few weeks I've been watching, I've seen episodes where Walker went back in time to solve two crimes that took place 150 years apart, one where he fought the Macho Man Randy Savage in an underground pit fighting league in a Louisiana prison, and one truly astonishing hour of television where -- and I swear this is actually the plot -- Gary Busey attempted to assassinate a Special Olympian by karate-fighting her in the middle of the day in a public park. And then I found out there's a Christmas episode. And not only that, but according to the episode summary, it's one where Chuck Norris fights a gang of evil Santas.Sadly, the episode itself doesn't quite live up to that premise, but it's not for lack of craziness. For those of you who aren't familiar with the show -- which means that you fit into that magic age group that's young enough to have never watched a lot of CBS programming but old enough that you don't have "irony" as your primary motivator in choosing entertainment -- here's the deal. 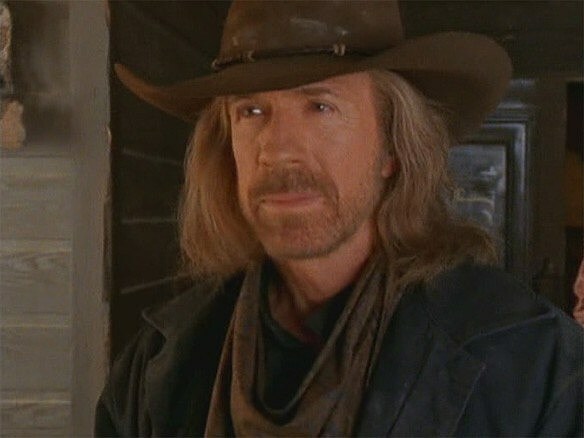 Chuck Norris stars as Texas Ranger Cordell Walker, who is basically exactly like Chuck Norris, except that Walker only hangs from the landing struts of four or five helicopters per year rather than the 10 or 11 that Chuck Norris averaged between 1983 (Lone Wolf McQuade) and 1994 (Delta Force 3: Deadly Reunion). His girlfriend Alex (Sheree J. Wilson) is the district attorney, his partner Trivette (Clarence Gilyard) is a former football star for the Dallas Cowboys, and by the time the episode in question airs, he's mentoring two other rangers named Gage (Judson Mills) and Sydney (Nia Peeples). And every single one of these characters has, at some point in the show's eight year run, fought a bear. Season 7's "A Matter of Faith" is actually the second of at least two Walker Christmas Episodes. The other, Season 3's "A Ranger's Christmas," sees Walker regaling a Dickens of orphans with the story of a (fictional) Wild West Texas Ranger who experienced the miracle of Christmas by deciding to kneecap rival gunfighters rather than just shooting them in the face. As you might expect, he looked exactly like Chuck Norris in an absolutely terrible wig. "A Matter Of Faith," however, is set firmly in the modern era, addressing today's topical concerns of soul-saving at gunpoint and the deadly, high-stakes criminal empires built on the backs of stolen Beanie Babies. Before we get to that action, though, the episode opens with the supporting cast trying to figure out what to get Walker for Christmas. Trivette asks him what he'd do if he found a hundred dollars, and in typical Walker fashion, he responds "I'd give it to Kick Drugs Out of America." This brings up an interesting point, if by "interesting" you mean "of interest only to people who are increasingly obsessed with Walker, Texas Ranger." See, Kick Drugs Out of America -- now known as KickStart Kids -- is a real-life charitable organization founded by (you guessed it) Chuck Norris that's featured prominently in the show. 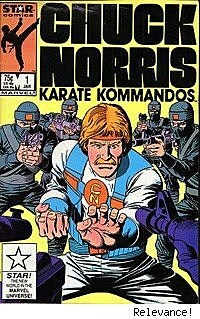 Now, it's actually established that Chuck Norris The Actor exists in the Walker universe (there's a scene in an episode where Trivette and Walker discuss how Walker's not really a fan), so that not only means that this is a universe with two identical Chuck Norrises, but considering how involved they both are in the charity, they could have actually met and teamed up to fight crime. It is an absolute tragedy that this never actually happened on the show. Anyway, talk of Christmas presents are quickly tabled, because there's been a sudden outbreak of SANTA CRIME! Sadly, this is the B-Plot, and will be handled by Gage and Sydney, and while that works out every bit as over the top as the rest of the show, it does rob us of the episode's promised Walker/St. Nick rumble, which I can almost guarantee would've ruined Christmas for everyone. Instead, Walker is involved in the episode's main story, which focuses on a church where the youngsters in the congregation are so poorly educated in matters of religion that when the kid playing Joseph in their Nativity play asks if he can have a room for the night, the kid playing the innkeeper says "okay." Then there's a quick recap of Jesus's secret origin, for the benefits of Walker viewers who may not have heard of it from, you know, the entirety of Western civilization over the past two thousand years. Once we're all up to speed, a new problem is introduced when one of roughly six thousand street gangs featured as villains on Walker breaks into the church to steal their Toys For Tots presents so that they can sell them on the Dallas/Fort Worth Metroplex's infamous action figure and collectible black market. In the process, the lead gangster, Paco -- whose falls somewhere south of the WWF's Razor Ramon on the Believable Accent Scale -- shoves Pastor Chavez into a wall, which causes him to immediately fall into a coma. He doesn't hit his head or anything, and seriously, I was pushed harder walking through the crowd at the San Diego Comic-Con. Dude is fragile. Either way, the attack sends Jose, a former gang member turned youth minister -- into a frenzy that causes him to set out on a mission of cold-hearted vengeance. Also, there's another former gang member, Juan, whose wife is pregnant. This will be important later. 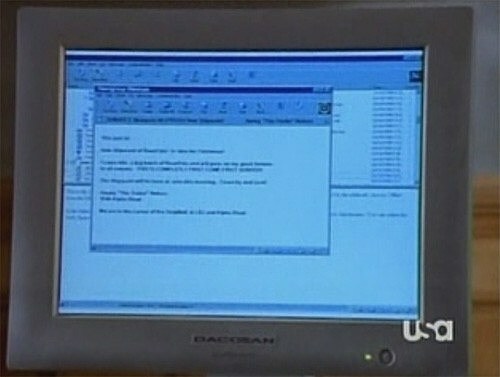 In order to track down the gang members before Jose can, Walker and Trivette turn to The Internet -- which was occasionally depicted on the show as a screen reading "DALLAS POLICE DEPARTMENT - OFFICIAL USE ONLY" in glorious Comic Sans -- to hack the mainframe and trace the virus through the server and jack in to the infonet directory to track their online cyber-perps down. Now, I'm not a master arch-criminal (yet), but I have to question the wisdom of sending an email announcing one's intent to fence stolen goods directly to the offices of the Texas Rangers. I have also never been roundhouse kicked in the face by Chuck Norris. I imagine these two facts are related. Meanwhile, Sydney and Gage are able to put an end to the Santa Claus Robberies through good old fashioned police work. And by that I mostly mean karate chops. To be fair, Gage also threatens a suspect with a chair leg during an interrogation. Back in the main plot, Juan goes to shoot Paco, but -- in the grand tradition of Christmas Episode that veer more religious than Santa Clausy -- Walker arrives just as they pull guns on each other and manages to convince Juan not to pull the trigger solely by quoting scripture at him. Yes, despite the fact that a good half of this episode has followed less of the teachings of Jesus and more of the Wu Tang Clan ("turn the other cheek and I'll break ya f----in' chin"), the spirit of forgiveness takes hold. ...and lands directly in front of Walker, because of course he does. Thus, the moment we all knew was coming from the second we found out there was a pregnant character on this episode: Walker delivers the baby. And not only that, but since young Jose Jr. isn't breathing, Walker & Co. (including the newly rededicated Juan) pray so hard that God Himself intervenes and miraculously causes the baby to breathe. Then, after a scene where the cast and crew break the fourth wall in order to wish viewers a safe and happy holiday, the episode ends. So while the promise of "Walker vs. Santa" may not have materialized -- outside of the truly epic fan-fiction I'm working on in my spare time -- we did get to see Walker deliver a miracle child born on Christmas Eve, and while I'm not as familiar with Biblical prophecy as some folks, I'm reasonably certain that means this episode is the first appearance of the Second Coming. And that, my friends, is a Christmas Miracle.